Raw Milk Stilton (Stichelton) Cheese for sale. Buy online at Zingerman's Mail Order. Gourmet Gifts. Food Gifts. Stichelton, England’s classic blue cheese. Raw milk Stilton wasn’t made from 1989 to 2006. With the guidance and support of Randolph Hodgson of Neal’s Yard Dairy, Joe Schneider has spent the past several years reviving this extinct cheese. Problem is, he can’t call it Stilton. The laws governing the name of Stilton prescribe that it be made with pasteurized milk. Even though it was made with raw milk for hundreds of years. 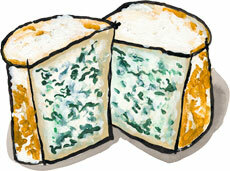 So he came up with the name Stichelton, the original village where Stilton was made—with raw milk, of course. If you tried to find this cheese in the UK, you'd need to ask for Stichelton. This is the only traditional raw milk Stilton in the world. Working in the cheese’s home county of Nottinghamshire, Joe and a staff of two turn 2,440 liters of fresh milk from their herd into Stichelton every day. The curds are hand-ladled before being set into forms and drained. Later, they're pierced with needles, and the famous blueing begins. Four to six months later we have the result: an exquisite, legendary blue with broad, buttery flavors that linger on the tongue. Randolph and crew select the best wheels for our customers. For hundreds of years the famous blue cheese has had its part at the British dinner table, often served alongside a glass of port and a handful of walnuts. The three do go well together, I admit.